A decade ago, when I wrote each year for the late-lamented annual guide, Wine Report, I was hard-pressed to find news in the Jura. Back then there was nothing much to report unless it was a little local argument between a producer and the wine authorities on labelling. Today I am hard-pressed to keep up with changes and developments, as well as forthcoming tasting events (see below). Most, but not all, of the changes concern producers retiring and handing over the baton to the next generation, or new producers coming in, the latter particularly in the vibrant organic sector. 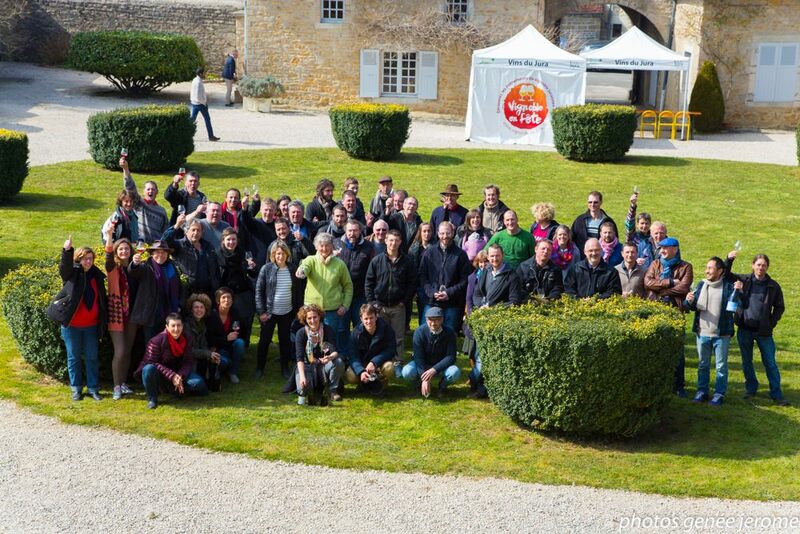 Having attended Le Nez dans le Vert tasting in Paris in November, I came back for their annual tasting in the Jura in March, where there were even more discoveries to be made. 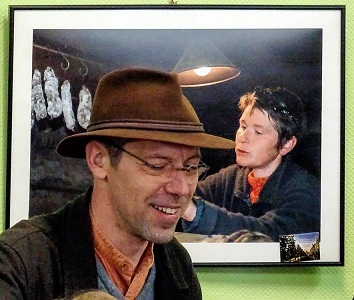 Stéphane Tissot and Jean-Etienne Pignier have taken over managing Le Nez dans le Vert, the informal group of Jura organic growers, from Bruno Ciofi (it takes two to replace this ball of energy). They introduced the show by saying the Jura was the most organic region in France with around 17% of vineyards certified, producing 1 – 1.2 million bottles. I made a point of tasting with the newcomers to the group. Guillaume Gilet started his tiny 1.5-hectare Arbois estate Les Donneurs de Temps in 2012 following wine studies and a decade working around France for different organic producers. He has taken on various organic parcels and applied for official organic conversion status in 2014. His winemaking is super-natural and what I tasted gave hit and miss results – as they say in French, à voir (we will see). Also from Arbois is Michel-Henri Ratte, who farms 9 hectares and was previously part of the Arbois fruitière (wine co-operative). His estate is certified biodynamic and a taste of the 2015, the first vintage that he has made himself with wines bottled especially early for the show, were very promising, especially the reds. I look forward to finding out much more about this estate with a visit soon. Eric Thill, a grower with vineyards in Gevingey in the Sud Revermont, who appeared in my book, has also joined the group. His particular style, influenced by his Alsace origins, won’t suit everyone, but his wines are very clean – his wines are fully certified organic from the 2015 vintage. Among other producers, I was not surprised to find several more experimental macerated white wines (orange-style) including a Savagnin 2015 from Domaine de la Pinte with very good potential, and from 2014 Savagnins from both Domaine des Bodines (Alexis Porteret) and Domaine Hughes-Béguet. But, the most enjoyable part of the tasting was discovering the quality of many of the 2015 reds, some bottled, others still in tank or barrel. The Poulsards in particular are tasting delicious – highlights were from Hughes-Béguet, La Pinte, Les Dolomies (Céline Gormally with her cuvée ‘A la Tienne Robert!’ serenely serving wines with her young baby – no. 3 – in a sling), Ratapoil (Raphaël Monnier) and Bodines. A barrel sample of Stéphane Tissot’s cuvée DD 2015 with one third each of Pinot, Poulsard and Trousseau, macerated for three months partly in concrete eggs and partly in wooden foudres, was delicious with great potential after what for me was an unsuccessful 2014. His Trousseau ‘15, aged in amphora, was also delicious – both are due to be bottled soon. Finally, 2014 white wines from the classic Sud Revermont domaines of Labet, Buronfosse, Miroirs (Kenjiro Kagami) and Champ Divin were tasting, well, quite divine. This really is a land of pristine, characterful and simply top-class Chardonnays. A table of books on sale was brightened by my book’s yellow cover and I was one of two authors present for signing, the other being the very modest photographer Jerome Genée. 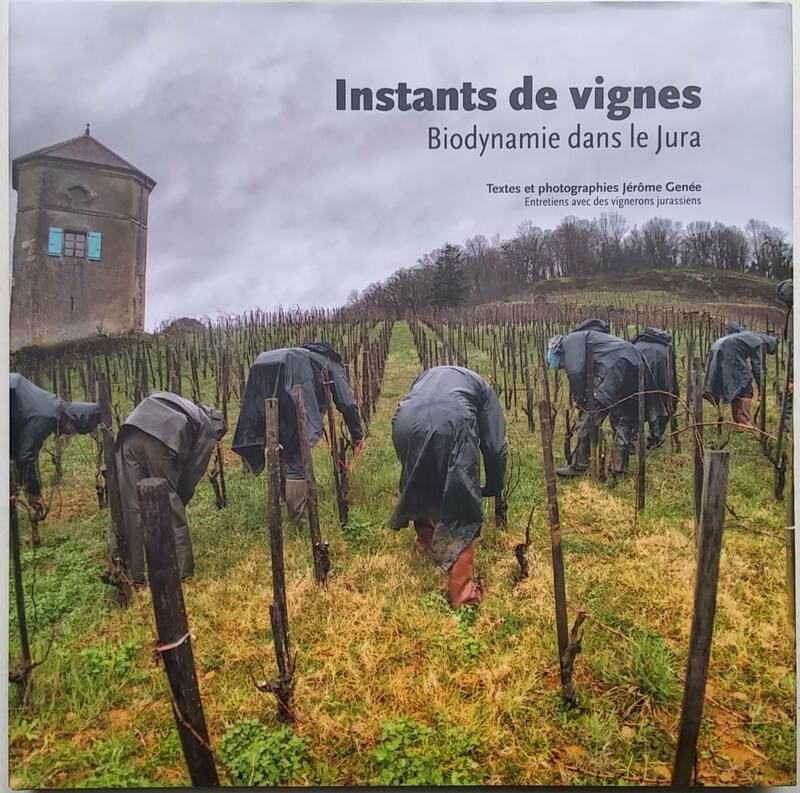 His beautiful book on biodynamic wine producers in the Jura, Instants de Vigne, was published at the end of last year. You can buy it direct from Jerome Genée’s website. In French, the text explains biodynamic practices as well as being lushly illustrated with photographs – it features Stéphane Tissot and Domaines Pignier, De la Pinte and Bourdy. At Tobacco Dock in London, The Real Wine Fair takes place on Sunday 17th (consumers/trade) and Monday 18th (trade/press only) April and this year there will be three Jura vignerons present – Julien Mareschal of Domaine de la Borde, François Rousset-Martin and … wait for it … Jean-François Ganevat on a rare visit to England. On Monday at 3.30pm I will be running a seminar, hopefully with Julien joining me, called ‘The Jura is In’ discussing what makes Jura currently the darling of sommeliers and indie wine shops. 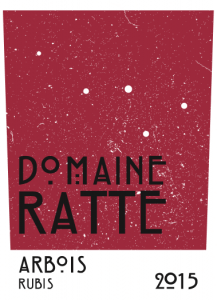 Domaine de la Pinte will be at the other big natural wine event in London, The Raw Fair, that takes place on May 15th and 16th at the Old Truman Brewery in Spitalfields, London. On the subject of La Pinte, the big news is that this domaine’s director, Bruno Ciofi will be leaving later this year after several months of handover to his successor Samuel Berger, who worked at a biodynamic estate in the Languedoc. 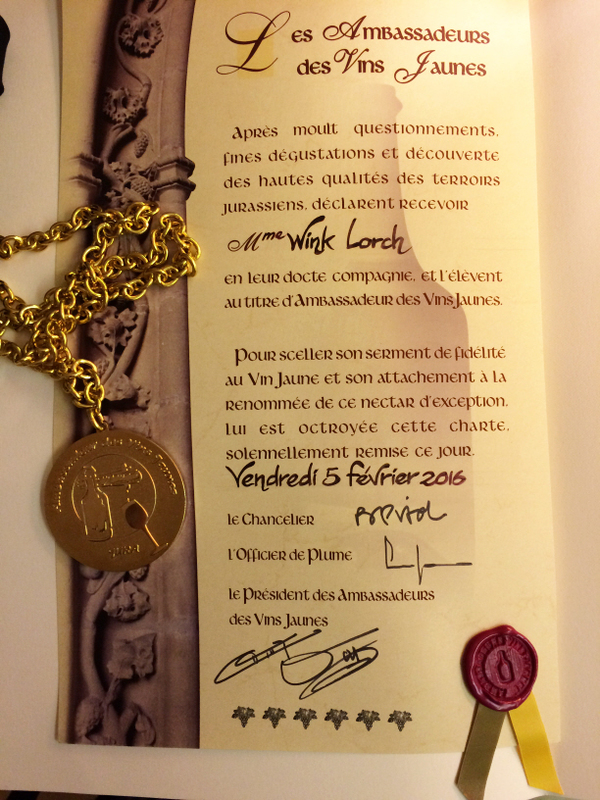 For the 2016 vintage Bruno is heading to the Loire to be with his girlfriend, Virginie Joly – he won’t be working at her family’s Coulée de Serrant estate, but will be joining Marc Angeli as partner in La Ferme de la Sansonnière in Anjou. The annual Jura wine trade tasting that usually takes place in May has this year been pushed back to early November, when an event will take place together with the Comté cheese promotional organisation. Details will be announced soon. The annual Jura wine producers US road show takes place next week. Yet again I was not invited to accompany them to present the seminars, to the disappointment of many vignerons, but it is out of their hands apparently – the tastings are organised by a Canadian PR company, who like to employ one of their own, who has visited the Jura once, I believe… The dates/locations are Monday 18th April in San Francisco, Tuesday 19th in Los Angeles (a first – and note that I have a new book stockists in the city – Lou Wine Shop) and on Thursday 21st in New York. There will be an excellent turnout of 20 producers, some there for the first time. Look out for tiny organic producer Domaine Wicky (represented by the delightful Christelle Wicky), also a chance to meet one of the new management of Domaine Grand, Nathalie, wife of Emmanuel Grand, and the up-and-coming André-Jean Morin of Domaine de la Touraize. To attend email Emilie Athot-Robitaille. Some of the established estates with importers will be hosting separate tastings. One fine-looking example is at The Ten Bells in Downtown New York on Wednesday 20th April with Stéphane Tissot. As already announced, Maison Jeunet has re-opened after the departure of Jean-Paul Jeunet, with chef Steven Naessens in charge – he has taken over the hotel-restaurant with his wife, and they have taken on Stéphane Planche as wine buying director. Meanwhile, Thierry Moyne has also hung up his chef’s apron and sold La Balance to his ‘second’, Maxime Montibert, who before joining Thierry had worked at Jean-Paul Jeunet. 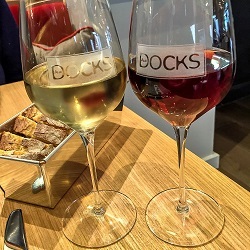 Meantime, in the centre of the little town, after a superb restoration of one of the old buildings on the square, a new restaurant has opened – Brasserie Aux Docks. It is a brasserie in the sense that they also have a bar and serve both breakfast and platters of meat, cheese or oysters (in season) out of lunchtime-hours, however for lunch and dinner the style is more bistrot, with a choice of four or five dishes for each course. On my two visits I’ve found the cooking to be excellent and the décor is refreshing. I need to express an interest. I have created their Jura wine list for what they call the ‘grande carte’ – there is a smaller wine list for those in a hurry, which I’ve not been entirely responsible for. The main wine list includes around 100 Jura wines from 40 producers including some real gems – you can scroll down the list of wines on their website. The selection reflects my book, including both organic and non-organic producers, however there is even a short selection of natural wines, and I persuaded some vignerons to release a few bottles from the great 2005 vintage – if you are visiting Arbois, tell the staff you know me! I will be attending the tasting on the 21st – were you will be notably absent 😦 Thanks for the recommendations of the new producers – will make sure to taste their wines.